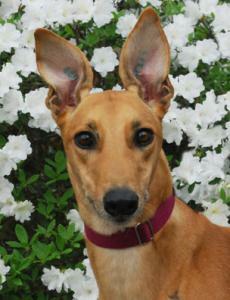 Broadford is a gorgeous red girl that raced at 68lbs. Her birthday is June 8th and she is another daughter of the famous Dodgem By Design. She retired a little over a month ago and has been good from the start in her foster home. It is almost like she has lived in a home at some point before. She seems like a calm, laid back girl that loves her dog beds and attention from people the most. Broadford is a friendly, happy girl. So far she has done great with a number of other dogs in the home of different breeds and even a small Italian Greyhound. She passed her cat and small dog test without interest in either so should be good in a home with either. She will play bow and pounce down into almost a down and try to get you to play with her. She is so cute and sweet. She can hold it for a long time in the crate and really tries to stay clean. She potties on leash so may be OK without a fenced yard. Brandy was a wonderful girl and was very happy in her home until she passed away on June 24th of 2016 from Bone Cancer.